I did a thing...(again) New Project! So I sold my 2000 Camaro Convertible a couple months ago because I didn’t have a need for a drop top in Oregon, instead I was in need of a machine better suited for the winters. So I figured on finding a Chevy pickup to be the winter ride so I don’t have to tear up my 17 Camaro SS and avoid getting stuck if really bad weather hits the area. In dream world i was looking for 67-72 trucks, but realistically 90-06 Silverado’s. Well I guess a dream can come true every once in a while. 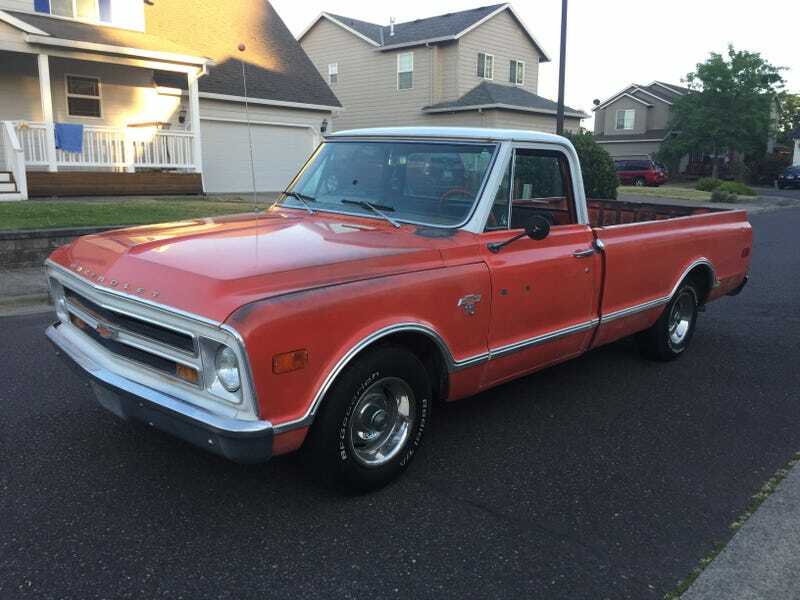 Found this 68 C10 Custom on craigslist a couple weeks ago. Went and looked at it, made an offer, guy didn’t like it, so back to truck hunting. Well then this week get a call and the guy would take my offer now as the truck hadnt sold fast and at his price like he thought. So was able to bring this bad boy home this weekend. This a 1968 Chevy C10 Custom cab. The truck is originally a so-cal truck so it is a super rust free truck. It checks all my boxes on a 67-72 Chevy. Little mirrors, chrome rear bumper, factory two tone, and the doors have never been cut for speakers. It was a factory I6 truck, but has and brand new crate 350 installed. Factory granny gear 4 speed, shifts good. Plans for the truck is to get it to a good driver for this winter and then next spring start doing body work and the cutting the bed and frame down to make a short box out of it. Then paint the truck to match my 68 Camaro and then have a nice driver pickup.